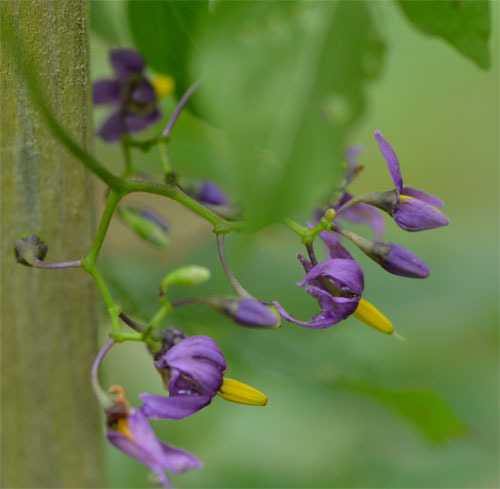 For some reason I always associated this plant with poisons brewed back in medieval times, but that would have been deadly nightshade (Atropa belladonna). This plant from Eurasia is to be found all over the cape in moist and semi-shaded thickets and brush. It is all over my yard as well. Although it may not be the killer of lore, it does have some poisonous qualities. The steroidal alkaloids have been known to poison cattle and sheep. There are more alkaloids in the green immature berries. Ripe berries don’t seem to be as bad. The plant is used widely in herbal medicine as a remedy for allergies and herpes. 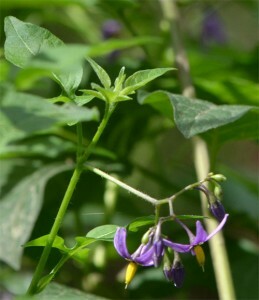 However, the plant should still be approached with some caution: Excessive application or ingestion of this plant’s materials can lead to paralysis of the central nervous system, a slowing down of the heartbeat or respiration, a lowering of the body temperature, vertigo, convulsions, delirium, and ultimately, death. The flowers are quite beautiful, and that may be a reason to keep the plant around. Birds also feast on the berries – they don’t seem to suffer ill effects (can you imagine a bird with vertigo?). Keep your pets and kids away, and wear gloves when touching the plant – the alkaloids are also present in the leaves.